Hi! This is my ninth year in the library and my ninth year at Radney. Radney is a great school with a wonderful staff and fantastic students. Fifth and sixth grade students are my favorite. In my beginning years as a teacher, I taught 4th, 5th, and 6th grade in Letohatchee and Sylacauga in Alabama and also in Dallas, Texas. I took a few years off from teaching when my two daughters were born. When they started school, I went to back school too. This time I worked with high school students who needed help passing the graduation exam. I did this until Mrs. Champion retired from the Radney Library. That's when I came to Radney! Other than with my job, my time is spent with my family. My husband Dave and I have been married for 42 years. We have a daughter (Lisa Peffer), three granddaughters (Brooklynn Berry, Riley Peffer, and Harper Brown), and two grandsons (Dalton Peffer and Chase Commander). We love spending time with them on the lake. We also enjoy watching Alabama football (Roll Tide!). I am also a dog lover. This picture is of me and our dog, Monty. 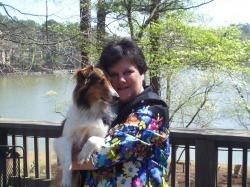 He is a rescued Sheltie.